Port Authority bombing suspect. Photo courtesy New York Alerts on Twitter. This is a Maine Examiner editorial piece and should not be confused with Maine Examiner’s news content. One of the most striking contrasts in America can be witnessed by watching left wing academics and the elite of liberal American politics rage against merit-based immigration reforms and heightened border security while fighting tooth-and-nail to keep conservative speakers and groups off college campuses. 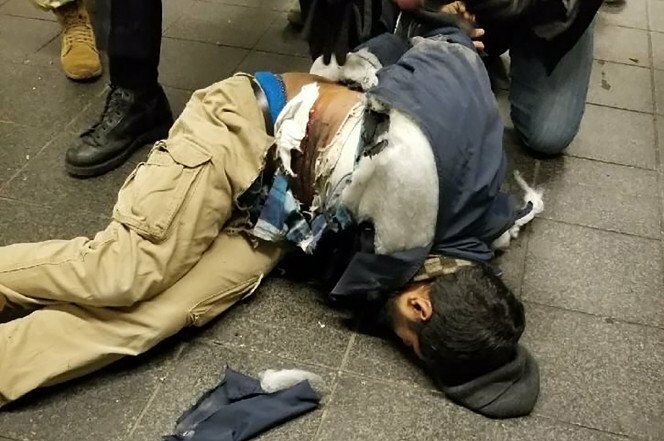 In the wake of the botched attack at a Port Authority bus station in New York by an ISIS inspired immigrant from Bangladesh, Americans learned that the attacker came to the United States on a chain-immigration visa. After the October attack in New York that claimed the lives of eight people when a terrorist ran them down on the streets with a large truck, Americans learned that the terrorist had gained entry to the United States through the United States’ diversity visa program. We clearly need to look at these programs and determine what we can do better to protect the American people. But that is not what we see happening. Liberals oppose reforms to our immigration system with a vengeance, declaring diversity the goal of the program, not a stronger, safer and peaceful America. On American college campuses, efforts are made to prevent or shut down conservative speakers. Conservative professors are shunned or attacked, if they even get a shot at being hired. Conservative groups are treated unfairly and face unreasonable obstacles based on administrative legalism just to conduct the most basic of activities. The same people who think diversity is the critical lifeblood of American economic growth and social harmony see diversity of thought on college campuses as a destructive force that could usher in a new age of “fascism”, or at least a very unwelcome invasion into their safest of spaces. It is impossible to reconcile how these competing visions can be honestly espoused by the exact same members of the liberal intelligentsia. If they believe, as they profess, that diversity is a key component of strengthening our institutions and making Americans safer, they should immediately implement a diversity lottery for American colleges and universities. Randomly draw the name of one qualified conservative individual per department, and hire them to bring ideological diversity to their own institutions. Likewise, let’s make sure more conservative students can attend these liberal-leaning institutions with a chain-admissions policy. The family of any conservative student who receives a degree from an institute of higher education should also be qualified for admission. If liberals truly believe diversity Trumps merit (pun intended), they should live it on campus. If the thought of living under the same approach on their campuses that they push on their nation as a whole is too much, they should get on board with the President’s plan. A law-abiding conservative speaker or Professor on a college campus should not face greater opposition and scrutiny than an able-bodied adult man trying to enter the United States from a known terror-state.